Our membership consists of two categories. 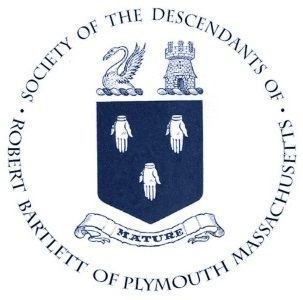 Anyone interested in the purposes of the Bartlett Society – investigating and preserving information pertaining to the said Robert Bartlett who came from England on the Ship “Anne” in July of 1623, and his descendants – may become an Associate Member, with all the rights and privileges of membership. The second category is Certified Membership. This means that an individual has proven / documented their descent from Robert and Mary (Warren) Bartlett. For the purposes of the Society, photocopies of recently accepted General Society of Mayflower Descendants papers and/or Warren Cousins papers, tracing through Mary (Warren) Bartlett, are sufficient to establish Certified Member status. An Express path to Certified Membership is available under certain circumstances. DUES of $10 are required to be paid annually to maintain your membership in good standing. Alternatively, two year’s dues are $18. In addition to dues, please submit a one-time application fee of $10 with your membership application synopsis. Other family members residing in the same household may join and maintain their membership for $5.00 per year provided the primary member maintains his/her membership. Click HERE to download a PDF version of our Synopsis of the Bartlett Descent Line form. Adobe Reader™ is required to view this form and is likely already installed on your computer. If you do not have Adobe Reader, you can download it here. Read an open letter from our Historian regarding the membership application process. If you are just applying for Associate Membership, so indicate on the Synopsis Form. We really want you to become a Certified Member if you qualify. We will try to help you. If you submit your lineage Synopsis Form to the Historian, he will check your line against our Bartlett database. You will not be asked to document those generations that have already been fully documented. In most cases, the first five generations from Robert Bartlett have been sufficiently proved. No documentation is needed for these generations. Some lines are fully documented to the eighth generation or beyond. The Historian will notify you which generations will require your sources. Click HERE to read the requirements for documentation acceptable to The Bartlett Society. You may remain an Associate Member while you are researching your line. We have no deadlines. No matter how long it takes. As an Associate Member you may attend reunions, receive the newsletter, and participate just like the Certified Member. If you need help in finding documentation, contact the Historian. (S)he may have ideas to try or places for you to look. Or click HERE for some research hints from Canadian Society of Mayflower Descendants. At present we are not certifying lineage for descendants of other Bartlett immigrants, however, we would be happy to have them and will include them in our “Other Bartletts’ Database. If you have photos from the 111th Reunion, please consider submitting them for The Bartlett Line! We are always looking for photos and articles for our biannual newsletter. Please send submissions to the Newsletter Editor. We accept submissions year-round.